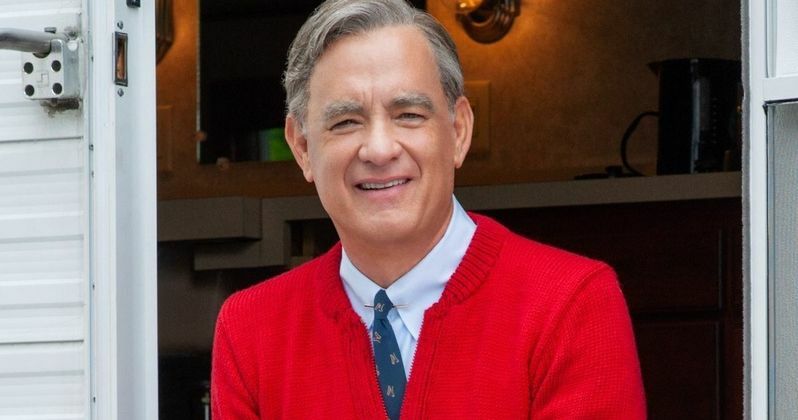 Sony Pictures has revealed the official title for their upcoming Mister Rogers biopic, which stars Tom Hanks as the late Fred Rogers, known best as the host of his popular and highly influential children's show Mister Rogers' Neighborhood. The movie had previously been going under the title You Are My Friend, but the studio decided to change that during the process. Now, they've revealed that the movie, quite fittingly, will be titled A Beautiful Day in the Neighborhood. The title seems quite fitting, as it recalls the lyrics, as sung by Fred Rogers, from the famous opening song featured in Mister Rogers' Neighborhood. Beyond the title, Sony hasn't revealed any other new additional details at this time. The studio did release a first image of Tom Hanks in character as the late icon back in September, which the collective internet embraced with open arms. Rogers was a beloved figure and a major part of many people's childhood. It seems like only a man as beloved as Hanks could possibly fill those shoes and have people embrace him. Though, we'll have to reserve any real feelings in regards to how this is going to play out until we see some actual footage. A Beautiful Day in the Neighborhood isn't going to be a traditional biopic recounting the life of Fred Rogers. Instead, it's going to focus on a very specific period of time later on in his life and the friendship he forms with journalist Tom Junod, who will be played by Matthew Rhys (The Americans). Junod, a known cynic, met Rogers when the journalist reluctantly agreed to write a profile piece on him for Esquire. During the course of their interactions, Junod has his outlook on life totally transformed. Marielle Heller, coming fresh off of her recent critically-acclaimed real-life drama Can You Ever Forgive Me? is in the director's chair for the biopic, working from a screenplay by Micah Fitzerman-Blue (Transparent) and Noah Harpster (Maleficent 2). Heller proved she has a knack for capturing a real person's true essence in Can You Ever Forgive Me? which sees Melissa McCarthy as writer Lee Israel. It's quite likely that particular biopic will wind up scoring an Oscar nomination or two, which bodes well for what the filmmaker may be able to capture with A Beautiful Day in the Neighborhood. The timing of this biopic also feels like it couldn't have worked out any better, as the recent documentary on Fred Rogers, Won't You Be My Neighbor? became a surprise hit at the box office and was met with near-universal praise from critics. The documentary is a sure bet for a Best Documentary Feature Oscar nomination. That should help position this movie as one of the most highly-anticipated fall releases next year. The cast also includes Chris Cooper (The Muppets) as Tom Junod's father. Marc Turtletaub, Youree Henley and Peter Saraf are on board as producers. Sony Pictures will release A Beautiful Day in the Neighborhood on October 18, 2019.